There are some certain cases in our lives when we need to appoint someone to manage our assets or make financial or health decisions for us especially when we are unable to do so. In order to make an agreement assigning someone and granting him or her the powers to act on your behalf in the form of writing especially about medical or financial matters, you must create a power of attorney for health care, also known as medical power of attorney. 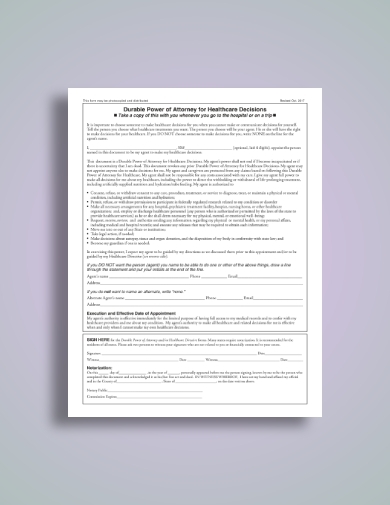 To give you ideas and insights on how to make and what to include in this power of attorney document, you can refer to the useful examples presented below. In order to designate someone to be your health care agent, you can formally grant him or her the powers to make decisions or recommendations for you through a power of attorney. Just like in this example, if you are the principal, or the one granting the powers, you must state your personal information, such as your name, address, and contact details; the limitations on the decision-making authority of your agent; designation of alternate agents; duration period; prior designations revoked; disclosure statement; and important signature, which includes the signatures of the agent, notary public, and two witnesses. It is important to choose someone whom you can truly trust and depend on to make health care decisions for you when you cannot make or communicate sound decisions for yourself. You can personally tell that person the health care treatments and arrangements that you want, so he or she will know your preferences. You must also provide the complete details regarding the contract or agreement through a legal document called medical power of attorney. 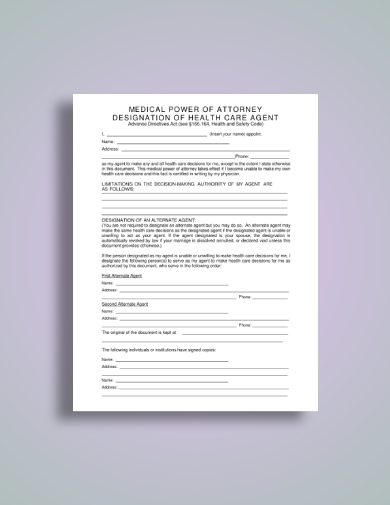 If you want your document to stay in effect even if you become incapacitated or unable to handle matters on your own, you can make a durable medical power of attorney, such as the one presented in this example. As stated above, a durable power of attorney stays in effect even if you are no longer able to handle matters on your own. With a power of attorney for health care that is durable, you can set out your wishes regarding your health care if you became too ill or injured to speak for yourself, and your trusted person or agent, also known as attorney-in-fact or health care proxy, will be the one to oversee your medical care and make health care decisions for you. 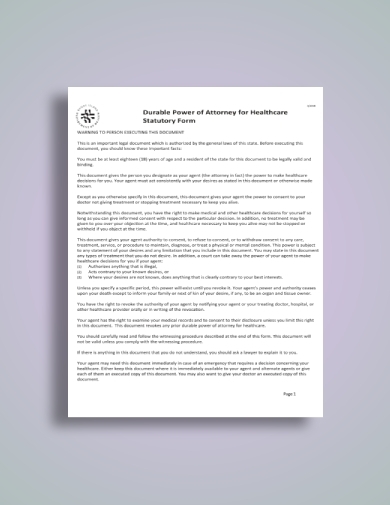 In this example of health care power of attorney, the following are clearly stated: the statement of revocation of prior assignments, a list and definitions of legal and medical terms contained in the agreement, names of the alternate agents, guidance to agent, authority of agent, special instructions, limitation of agent’s authority, additional instructions or limitations, expiration date, statement regarding the release of agent’s personal liability, and signatures of the notary public and the witnesses. This comprehensive medical power of attorney is an example of an advance health care directive where a combination of a durable power of attorney for health care and health care declarations is included in the document. 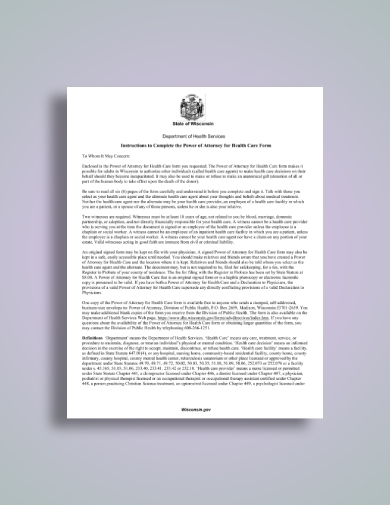 Also contained are the information and important facts about the document, designation of health care agent, effectivity date and durability, HIPAA authorization, power of the agent, organ donation, effect on declaration of a desire for a natural death, statement of desires concerning life-sustaining treatment as well as regarding tube feeding, administrative provisions, and signatures. In writing a power of attorney, remember that you must make your wishes not only clear but also detailed and direct so that your agent and healthcare providers will know the specifics that you want for your health care plan. Similar to this example, you must provide a document with the following complete details: explanation regarding the medical power of attorney, designation of health care agent, effectiveness of appointment, revocation, general statement of authority granted, special provisions and limitations, organ donation, guardianship provision, reliance of third parties on health care agent, and miscellaneous provisions. 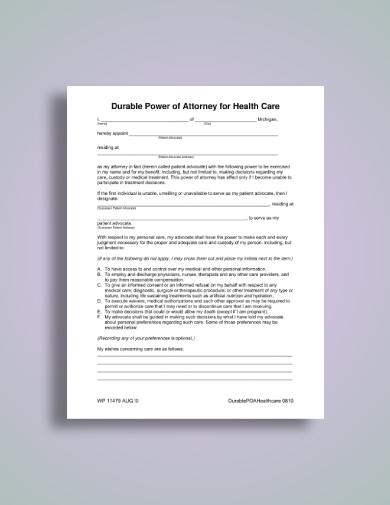 You can refer to this example if you are planning to create and issue a power of attorney for health care. 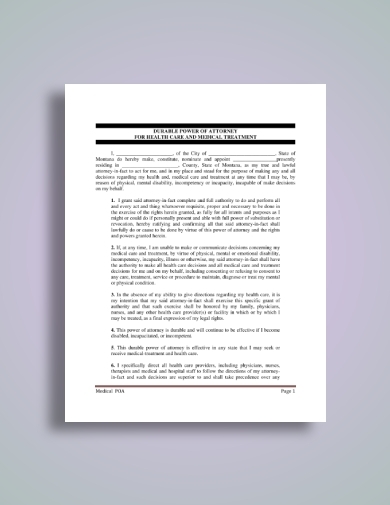 This document contains the instructions to complete the power of attorney for health care form, the definition of terms, the procedure for signing a power of attorney for health care, general provisions, designation of health care agent, general statement and limitations of the authority granted, statement of desires and special provisions, disclosures, and statement of witness. 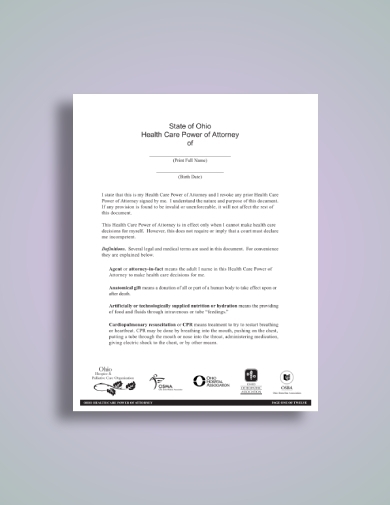 Create a power of attorney for health care that would take effect even when you become incapacitated by referring to this durable power of attorney for health care example. In this simple document, you can appoint someone as your health care agent by writing his or her name on the blank space provided and his or her location and contact details. You must also be specific regarding the powers you wanted to grant to your agent to avoid confusion and future disputes. In this durable power of attorney for health care statutory form, you will be guided regarding the creation of a durable power of attorney for health care, the general statement of authority granted that you can include, the statement of desires, provisions, and limitations, the duration of the power of attorney document, the designation of alternate agents, and other stipulations and provisions related to the creation of power of attorney. 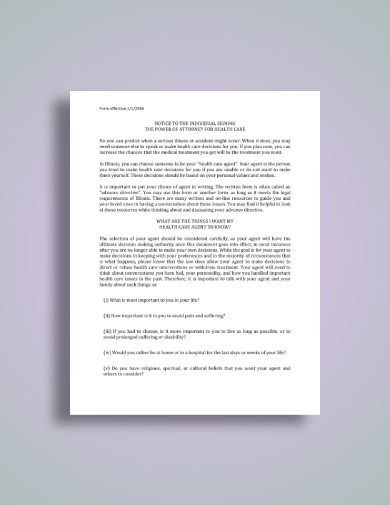 This document will serve as your guide through the questions with related explanations such as the following: what are the things I want my health care agent to know? What kind of decisions can my agent make? Who should I choose to be my health care agent? What if my agent is not available to make decisions for me? 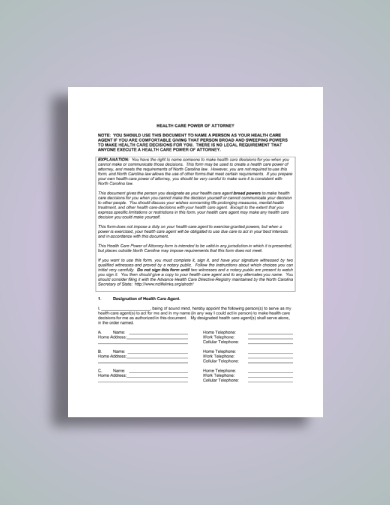 These are just some of the questions included in this document that will surely help before you start creating your own medical power of attorney.